Home / Unlabelled / 6 Nigerians Fall Into Extreme Poverty Every Minute. 6 Nigerians Fall Into Extreme Poverty Every Minute. 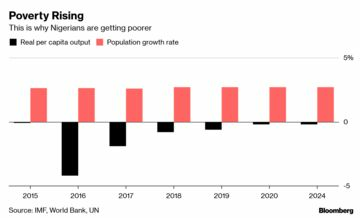 Nigeria’s population is growing and gross domestic product per capita shrinking, and that will continue until at least 2024, according to the International Monetary Fund. That means six Nigerians fall into extreme poverty every minute, the World Poverty Clock shows. If the current trend persists more than 120 million Nigerians, or 45 percent of the population, will be living in extreme poverty, that’s less than $1.90 a day, by 2030.